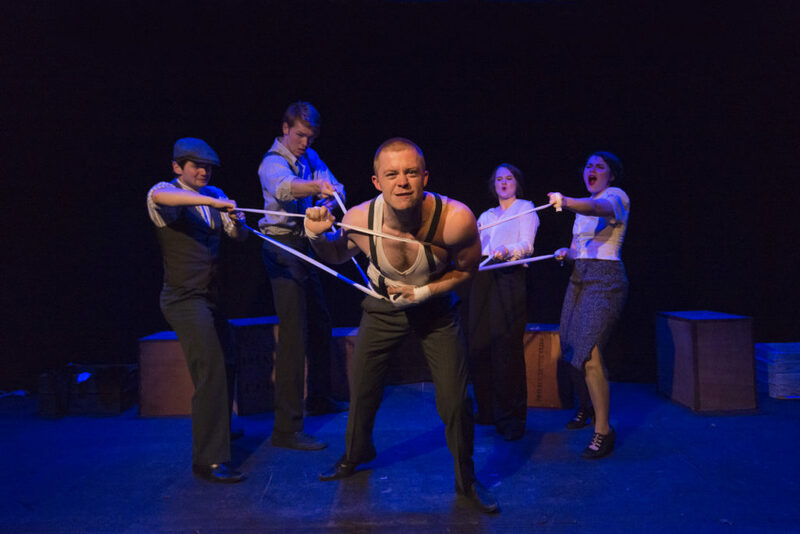 Where better to stage a tale of London’s 1920s criminal underworld than in a venue hidden behind anonymous double-doors down a service road below Waterloo Station (yards from where eight men were killed in a 1927 riot between the McDonald and Sabini gangs)? It’s here, as part of the VAULT Festival, that the suitably-named Incognito Theatre Company tell, with immense vitality, a story of two small-time East End gangs. One, all-male, is a group of pals recently demobbed and desperate for the good life; the other is an all-female team who delight in duping drink-sodden gents as they roam London’s clubland in search of a good time. Tiring of the petty rewards to be gleaned from fixing fights and picking pockets, respectively, the brawn and brains realise that they could be better together and form a powerful alliance. Led by the ambitious Felix Vance (George John) they grow into a syndicate of successful felonious enterprises, enjoying glamour and excess to the point where they feel, mistakenly, ready to take on London’s most dominant and vicious gang. There is another gang at work here in the team of old school friends who founded this now independent theatre group. As well as exuding rambunctious esprit-de-corps, the onstage members create five well-delineated characters and enliven a familiar genre with some fluid story-telling. Angus Castle-Doughty is perfect, attacking the role of pugilist Tom Carlisle with fierce commitment while still creating empathy. Jennie Eggleton inhabits the hard-as-nails Elsie Murphy with chilling accuracy. All display impressive accents and movement, not to mention the stamina necessary when dialogue is woven into a continuous sequence of beautifully lit moments of physical theatre. The non-stop pace allows few pauses for breath with audibility suffering slightly, but even at full pelt the cast manage to invest unlikable characters with redeeming qualities. The high point is an illegal boxing scene in which bandages are used ingeniously to evoke the ring from various angles, including the vertigo-inducing perspective of the Tom as he takes his dive. Credit goes to Director, Roberta Zuric, Choreographer, Zak Nemorin and Fight Choreographer, Lisa Connell but also to Sound and Lighting by Oscar Macguire and Freya Jefferies. The script sags when the mob reach the height of their infamy as, with nowhere to go, the characters reflect, row, dance and drink together without further exploration of their lives, relationships, or anything else. But that is a minor reduction in the voltage of this energetic display. The company’s all-female management have clearly inspired a team ethic, as off-stage and on-stage creatives work throughout to create an hour of relentless entertainment. Their slick yet punchy show proves that gangs work well in the West End too. Set against a complex and rich history, believers and non-believers, ex-IRA and those who moved to England, a series of characters navigate today’s Northern Ireland. The Catholic Church worry about the possible secularisation of schools. Mary has found her vocation and wants to become a nun. Barry stabs a man simply because he is black. Dominic killed three men whilst he was a volunteer with the IRA but now even the police don’t know. Those who have left are resented by those who have stayed. 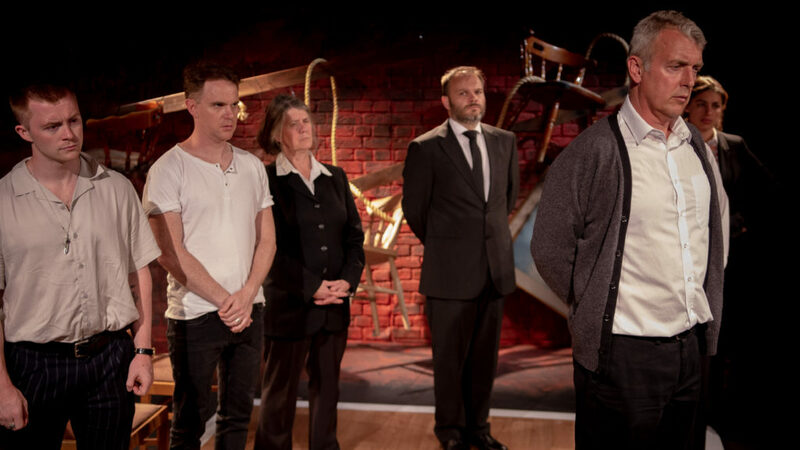 This is a play about the Troubles, about religion – Catholicism and Protestantism, about race, nationalism, loyalism, terrorism, reconciliation with one’s past. In fact the incredible breadth of this play is one its issues. Seamus Finnegan tries to cover every aspect of this topic, to address and consider every angle, and leave no viewpoint silenced. This is an ambitious task and one that falls short of being achieved. The play’s breadth means we meet a huge range of characters, some of whom are quite similar and seem to serve the same purpose within the narrative. It is also an unrealistic task to ask the audience to emotionally engage with that many characters, meaning certain narratives are a lot more effective than others. Furthermore, to understand the many perspectives, a huge amount of historical knowledge is required and in an admirable bid for accessibility, there is definitely an attempt to provide this all within the play. Unfortunately the reality of this is an overwhelming emphasis on exposition, at points moving closer towards a well delivered history lesson. Finnegan needs to find a personal route into this history in order to discuss in it a way that is engaging onstage, but this is something he only succeeds at doing sporadically. The cast are consistently strong, adapting from role to role with ease, ensuring each character is distinct without being overdone. Shenagh Govan is particularly standout, bringing strength and a wonderful comic timing to each of her roles. Equally her narrative arch in her role of the mother of someone choosing to become a nun, is deeply moving and beautifully presented, small but sufficient snatches of grief. This is where Finnegan’s writing style does excel – no word is ever wasted, no moment overwritten, the line between showing and telling has been clearly found. Angus Castle-Doughty is also notable, bringing a lovely pace and energy to his characterisations. This is a well-delivered, well-executed play, laced with lovely moments of humour and drama, that is just trying to cover too much. Streamlining this into a more coherent piece, formally and thematically, would help create a more engaging overall production.